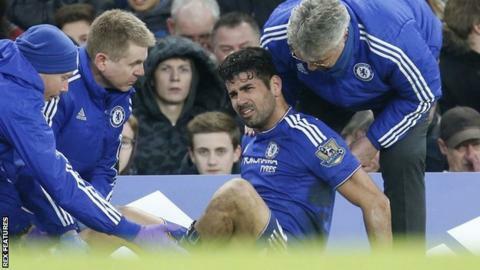 Chelsea striker Diego Costa suffered a bruised tibia in Saturday's 3-3 draw with Everton, scans have shown. The 27-year-old scored one and made another before limping off in the 80th minute at Stamford Bridge. Speaking after the match, interim Blues boss Guus Hiddink said Costa had been "in a lot of pain" - although it is unclear how long Costa could be out. Chelsea next play away to Premier League leaders Arsenal in a 16:00 GMT kick-off on Sunday. Spain international Costa has scored five goals in five games for Chelsea since Dutchman Hiddink was appointed in December. He was their top scorer last season with 20 goals as Jose Mourinho led to the club to a Premier League and League Cup double, but had scored just four times before the Portuguese was sacked.